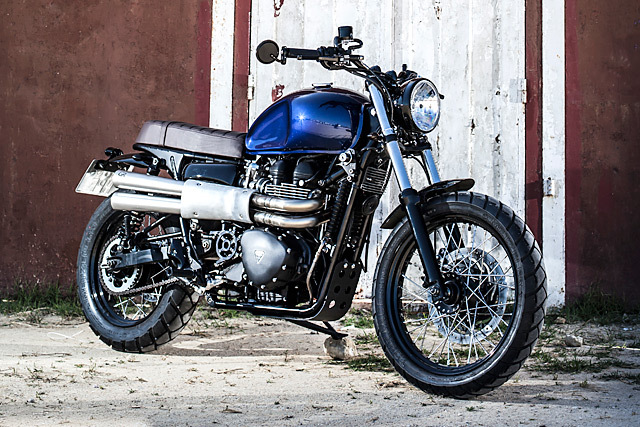 The Scrambler is my favourite of the retro classic line up. It’s strikingly good-looking, reliable as any other Triumph and the engine has far more character than the standard 360-degree powerplant offered by Hinckley. 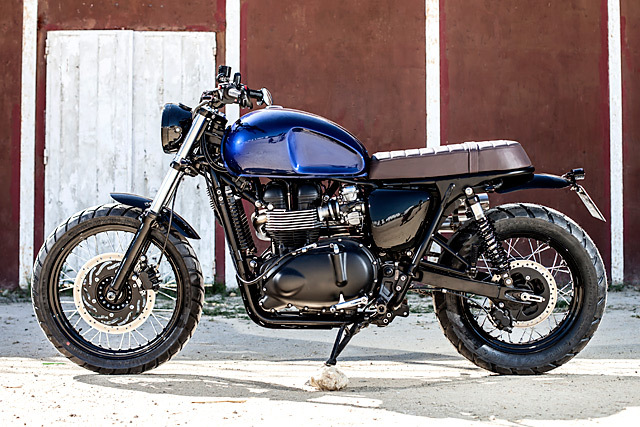 It’s an ideal everyday ride, for around town or even some light off-road work. 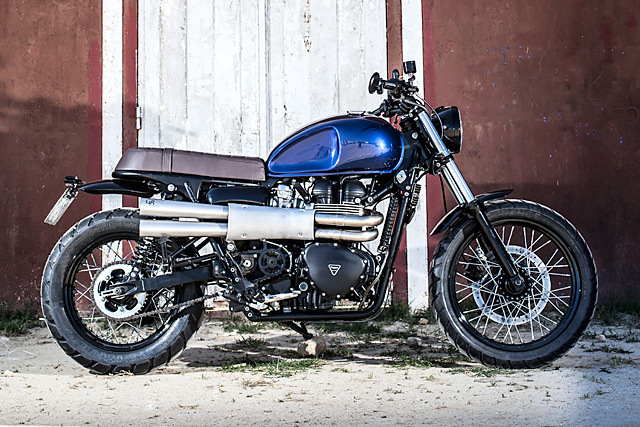 And that’s how this custom started, when Spanish workshop Macco Motors were approached by a client who wanted to customize his 2013 Triumph Scrambler. 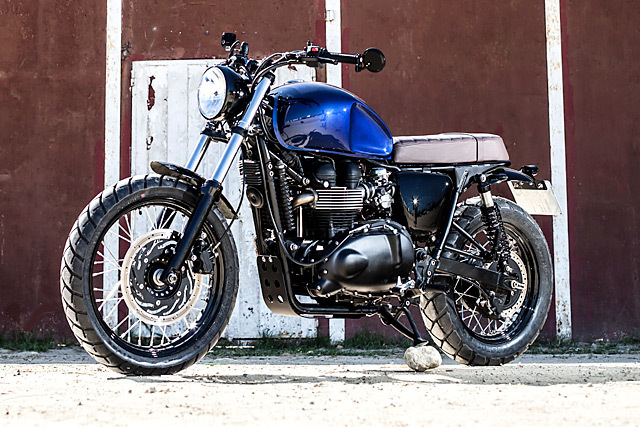 The owner, Gonzalo, had been riding the motorcycle around the rural outskirts of Barcelona for the last two years, but he wanted something more than the standard offering from Triumph. “The idea was to build something simple and with a strong look at the same time.” the guys from Macco say. And after some research and some clever modifications, I think they’ve nailed it. The first thing that team from Macco did was to scour the internet for some images of enduro bikes from the 60’s and 70’s, from an age before Krusty Demons and Monster energy drink sponsorship relegated dirtbike aesthetics to the backwards-cap brigade. 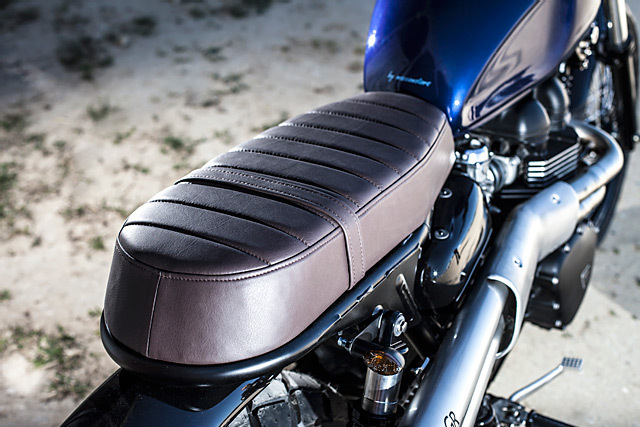 “We reviewed the look of vintage scramblers and trail bikes, with their high seats and compact lines,” Macco say, “And we were pleased that Gonzalo was open to some new ideas and colours.” A plan was drawn up and presented to their customer. After a nod of approval from Gonzalo, work started to trim the Scrambler into something cleaner. First to change was the awkward headlight ears on the standard model, with a new 7” lamp fitted with an ‘invisible’ bracket, inconspicuously mounted from the triple tree. 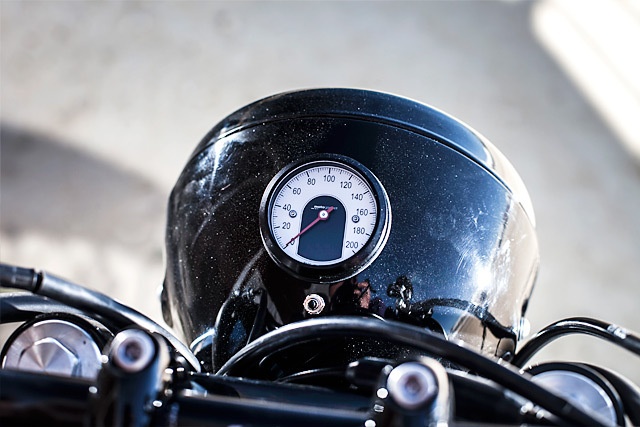 The ungainly plastic speedometer and idiot lights that are fitted to the Triumph were also ditched, replaced by a Motogadget Mini mounted flush into the headlight bucket. 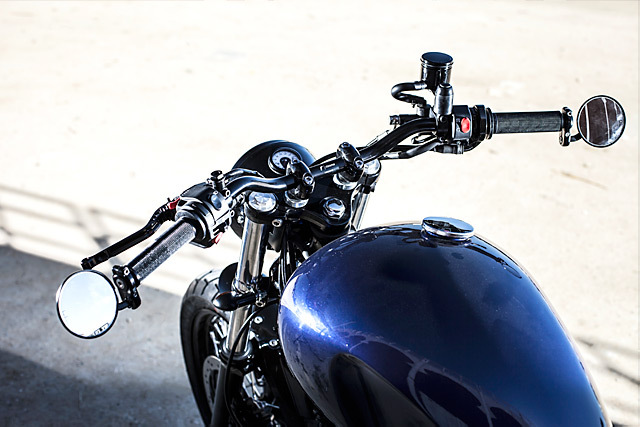 Behind that, Rizoma bars and brake fluid reservoir are matched to bar end mirrors, helping keep the front end far simpler and cleaner than the stock bike. Next, the team at Macco turned their eyes to the fuel tank. They decided the bulbous, rounded lines needed to be altered, but swapping out a tank on an EFI bike can be troublesome at best, with the tank mounted fuel pump being sensitive to any shift in position. Instead the team worked with the existing shape, indenting the sides of the tank giving it stronger, better defined lines. It’s a simple modification that turns the indifferent look of the standard fuel tank into something a little more aggressive. 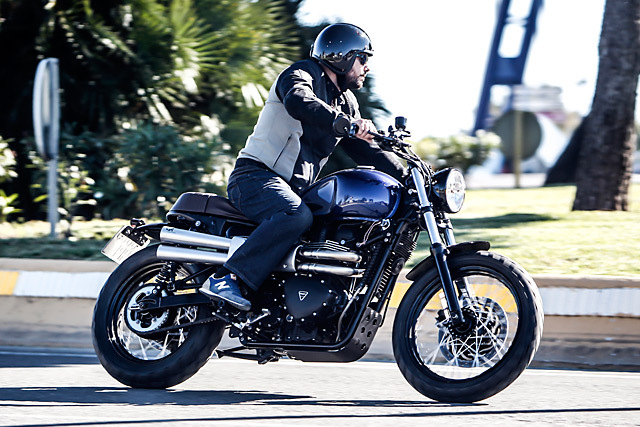 Despite the 270 degree firing order of the pistons, the larger front wheel and smaller headlight, the main feature that defines the Triumph Scrambler is the chromed twin exhausts. However the owner wanted them swapped out for something a little more distinctive. “Gonzalo was keen on trying some different pipes. Something simple but smaller. 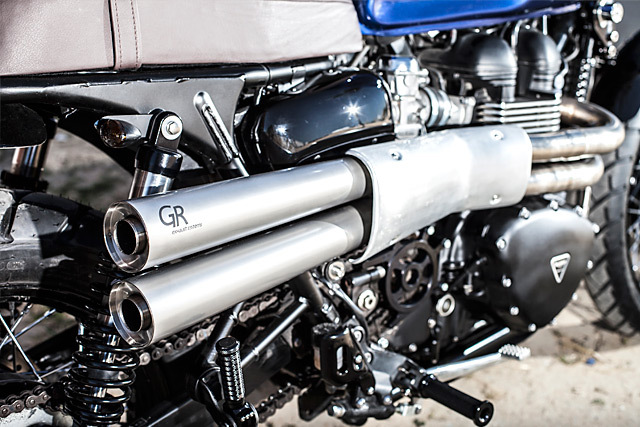 We designed a shorter than standard pair of slim exhausts, coming in parallel from the engine and with some protection to keep the legs really safe.” After a briefing from Macco, Roberto from nearby workshop GR exhausts made the plans a reality. And I think that’ll be the case with the rest of the bike. The build is restrained and practical, with the bike running indicators and fenders, mirrors and good quality rubber. It’s got new Hagon suspension at the front and rear, a larger than standard headlight and a thicker, more comfortable seat. The Climber is one of the rare builds that you’ll see which manage to refine the looks of the original without sacrificing reliability or safety. Gonzalo’s got to be one very happy customer.